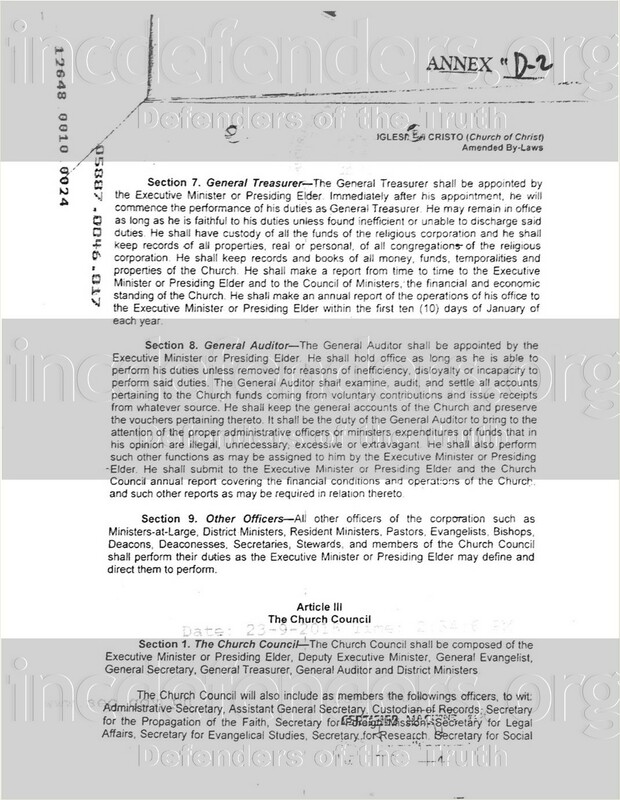 “That in the case of vacancy in the office of the Executive Minister or Presiding Elder, The Church Council shall convene and determine by election who shall be the successor. 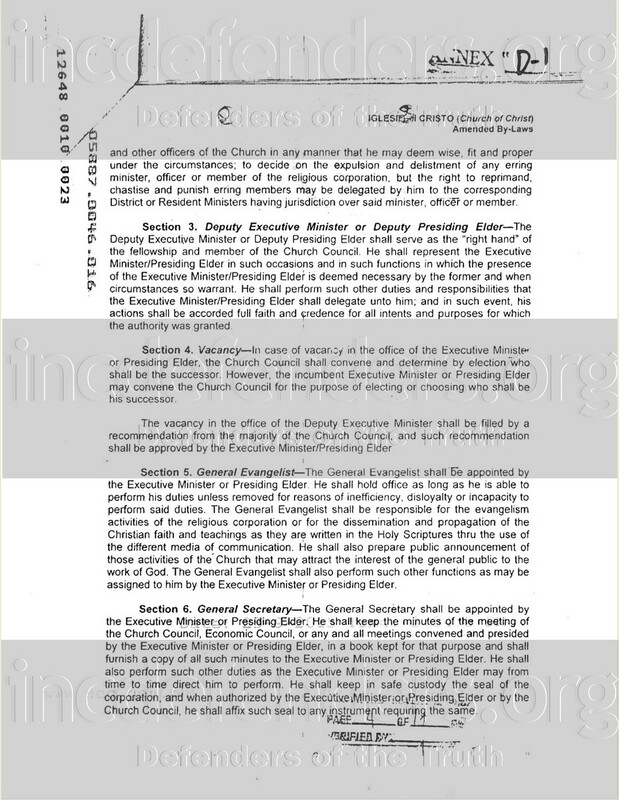 However, the incumbent Executive or Presiding Elder may convene the Church Council for the purpose of electing or choosing who shall be his successor. 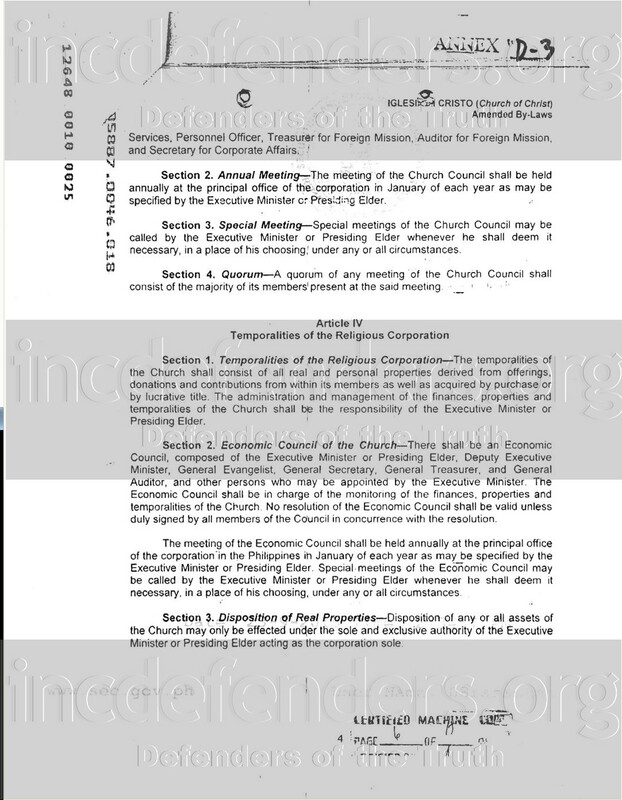 The vacancy in the office of the Deputy Executive minister shall be filled by a recommendation from the majority of the Church Council, and such recommendation shall be approved by the Executive Minister / Presiding Elder (see attached document). 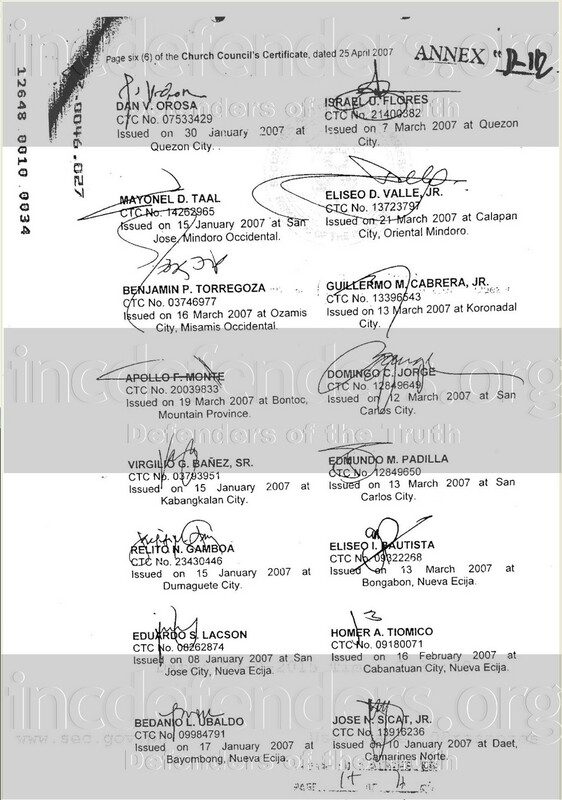 When Brother Erdy died in 2009, the Council did not carry out his instructions and instead allowed Brother Eduardo V. Manalo to be the Executive Minister without going through the process of election. They kept silent about this, and more than 6 years later, they still are. 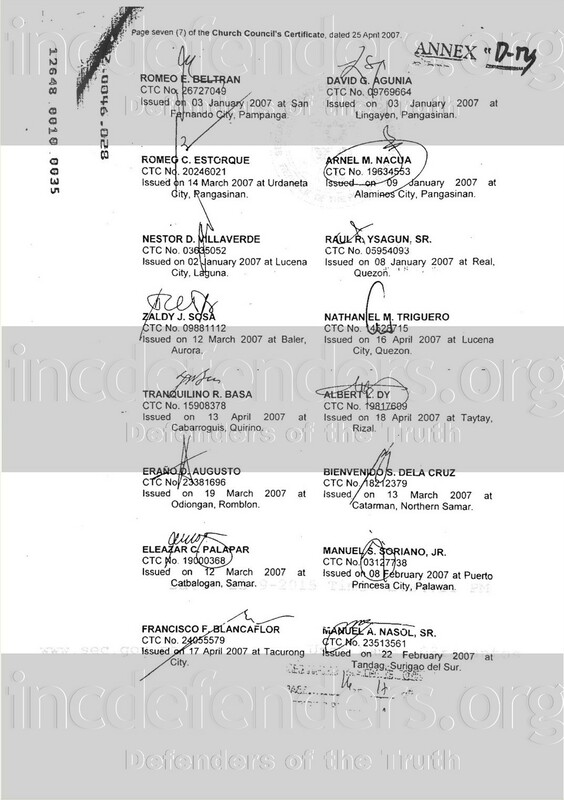 In WITNESS WHEREOF, We have hereunto set our hands this 25th day of April 2007, in Quezon City, Philippines (see attached document). 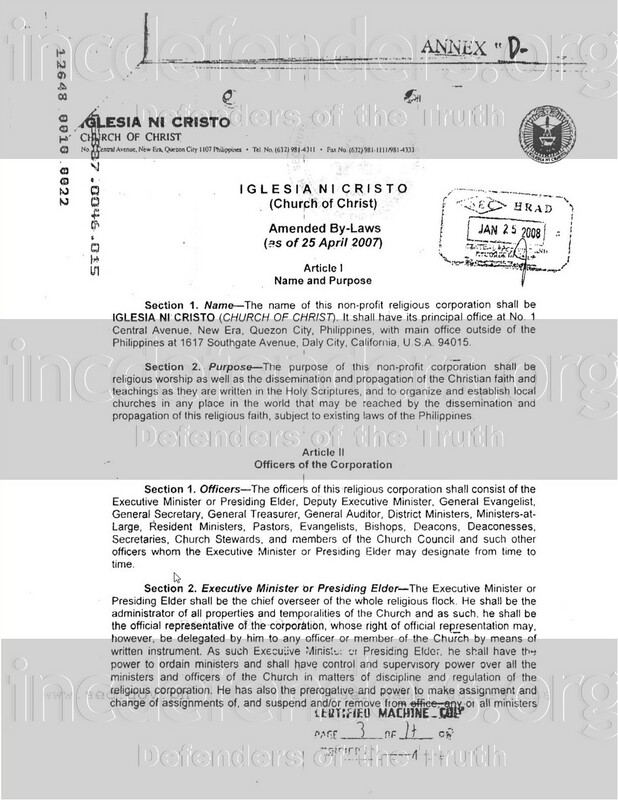 This document proves that the contents of the Amended By-Laws were suggested, discussed, and approved by the Church Council. This includes an election process the moment the office of the Executive Minister becomes vacant. 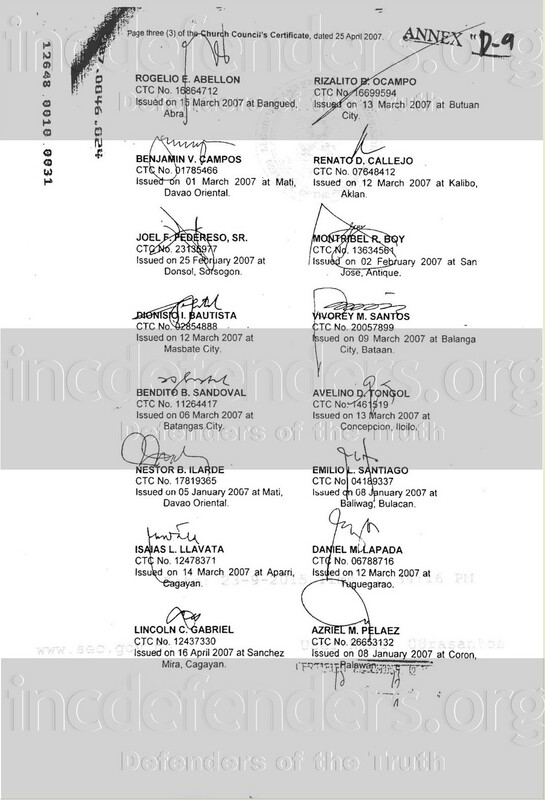 Brother Erdy’s directive to elect the next Executive Minister is a sensitive matter because he gave such an instruction although brethren already knew that Brother Eduardo has been chosen as successor on May 6, 1994. The Council did not seem to understand Brother Erdy’s reason for amending the “By-Laws” in 2007, and chose to ignore his directives. If they understood the reason for the amendment, what important reason do they have for not following it? Did they keep silent just to avoid church controversy, or was it just that they no longer value their sworn promise to Brother Erdy? 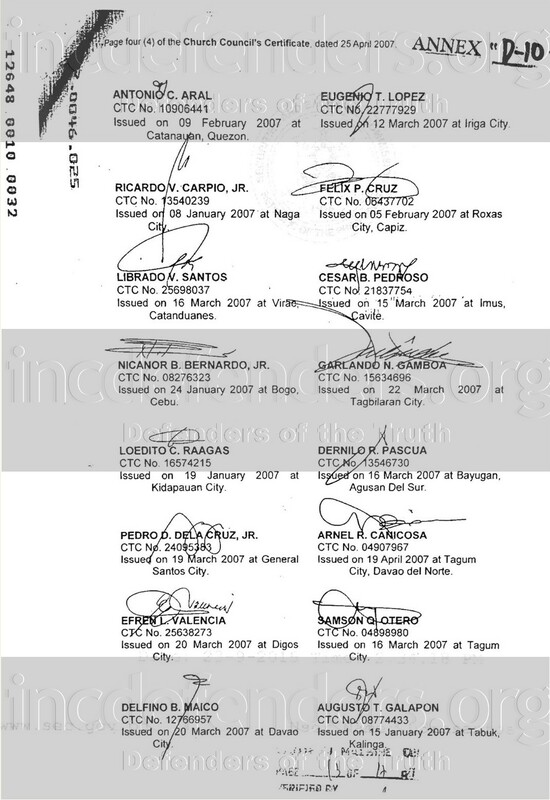 Our honorable Church Council members, you will find your names and signatures in the Church Council’s Certificate. May it serve as a reminder and may you realize that the moment you affixed your signature, you committed yourself to the task of carrying out Brother Erdy’s directives the moment he passes away. You did not fulfill this obligation. Instead, you allowed the Church to be ruled by someone who has not gone through the process of election as required by the amended By-Laws. You allowed the Church to be ruled by someone who has been found unworthy of Brother Erdy’s trust. 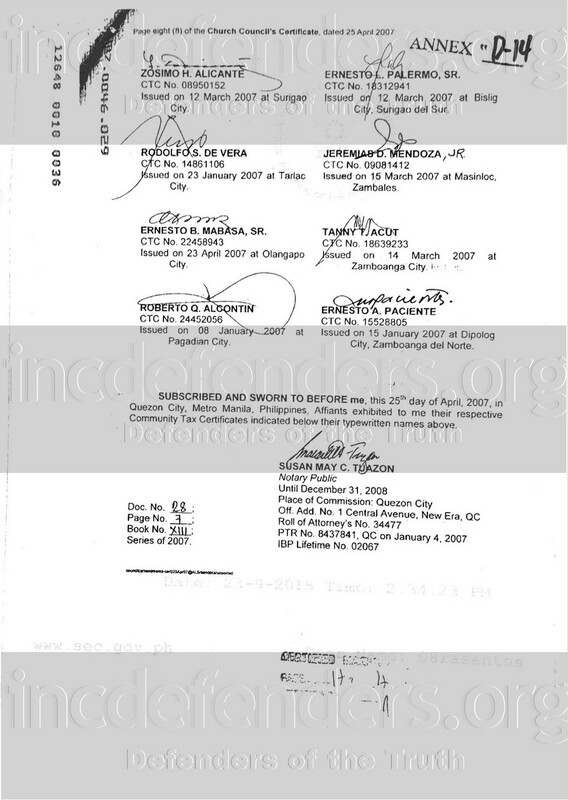 Do you know that your silence pushed Brother Eduardo to blatantly disregard Brother Erdy’s important directives, which you yourselves accepted and agreed to implement? Do you know that your continued silence is the reason for the present Church crisis, which is the consequence of being ruled by an administration that does not have God’s approval and blessing? 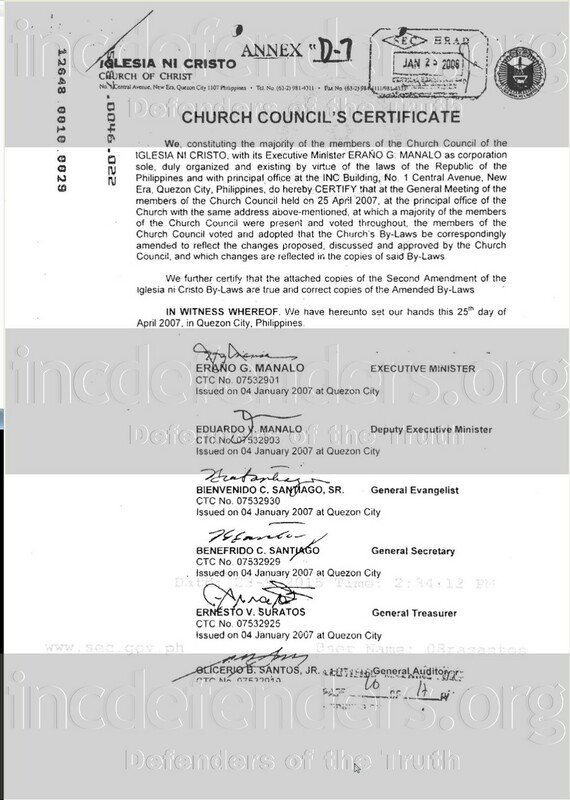 In light of your shortcomings, is it right for you to say that Brother Eduardo is the legitimate Executive Minister of the Church of Christ today? Until when will you keep silent about the crisis in the Church and its leadership? 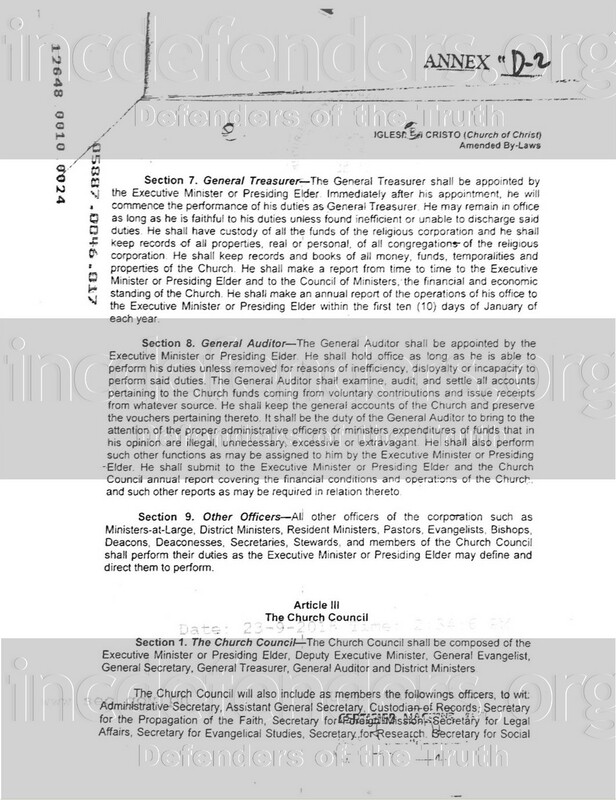 Until when will you allow our brethren’s hard-earned voluntary contributions to be used for activities that are not church-related? To be wasted on “bad investments” and on the upkeep of the luxurious lifestyles of crooked ministers and their families? Until when will you allow the reckless selling and leasing of church properties? 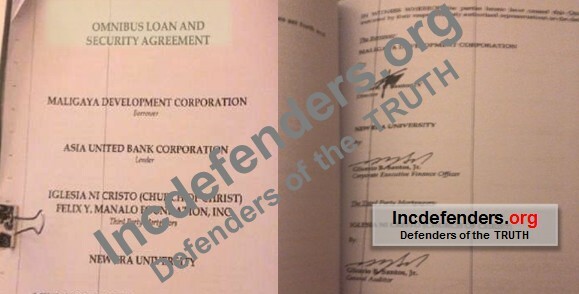 Do you understand that banks will foreclose the church’s many properties, including the housing that shelters you, if the church is not able to pay its enormous debt? Regarding the discord amidst the brotherhood, until when will you allow brethren who say they are “One with EVM” speak hurtful words to demean and curse those who are exposing the anomalies and the evil happening in the Church? Many other legitimate church concerns are not addressed because you choose to keep silent. Where do you stand now that the Church badly needs your help defending it from those who are taking advantage and destroying it? If Brother Erdy were alive today, do you think you’d be in the same situation – keeping silent despite the crisis in the Church and its leadership? How steadfast and brave were you at the beginning, defending the Church and implementing God’s commands and instructions together with Brother Felix Manalo or Brother Eraño Manalo? What happened to you, our beloved teachers and respected church pillars? It’s time for you to wake up and to make a firm and true decision to fulfil the promise you have turned your backs on and to make yourselves worthy of your garb as ministers of God. Why don’t you once again clothe yourselves with our Lord Jesus Christ and let Him reign in your lives as carers of the flock? May you find the time to ponder on this article’s messages and pleas. Don’t forget that the Church you are leading is the true church. This is the only Church owned by the Lord God and the Lord Jesus Christ in these last days. This is the only Church where people will receive salvation on Judgment Day. You are the ones trusted by The Father and our Lord Jesus Christ to take care of the Church. Therefore, administer unto the Church not your own will or any other person’s, but the will of the Father and of our Lord Jesus Christ. Present Church administration should be like the administration of the apostles and elders in the first century Church. When the Lord Jesus Christ ascended to heaven, he left the Church under the administration of the apostles. Apostle James was elected to be the Executive Minister during that time. His helpers were the other apostles and church elders. (Acts chapter 15). They took care of the church and showed concern for it, from deciding decrees and instructions (Acts 16:4), strengthening the faith of the disciples (Acts 14:22), encouraging them to live righteously (Ephesians 4:21-24), spreading the gospel (II Corinthians 9:12-13), and even resolving conflicts, issues (Acts 15:6-13, 19), and other similar matters. 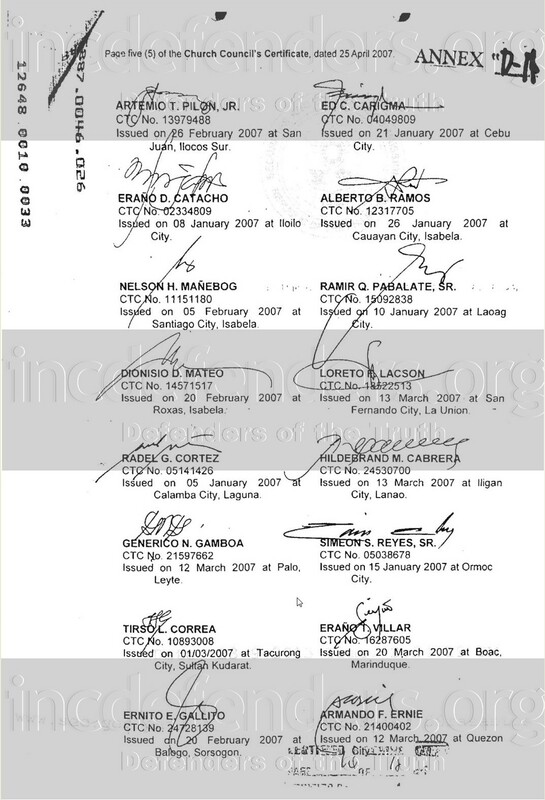 The first Church leaders, Brother Felix Y. Manalo and Brother Eraño G. Manalo, administered the Church in an orderly and effective way with the help of their faithful consultants and helpers. 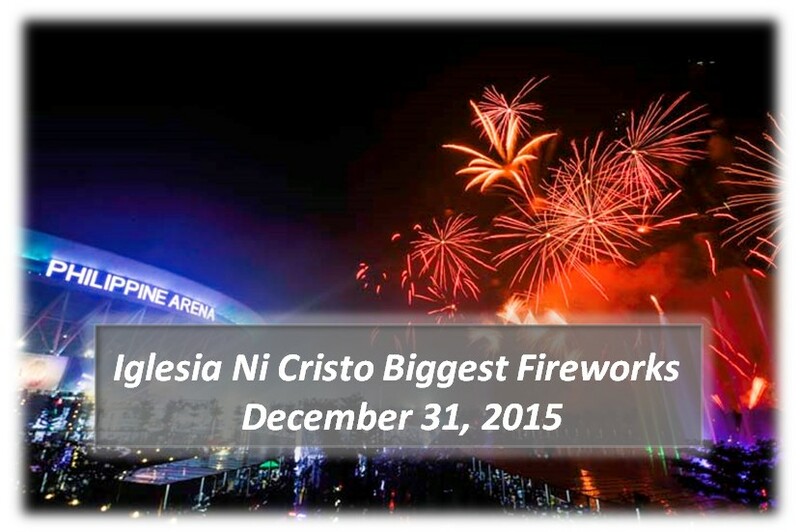 They were able to fulfill their part in bringing the Church to its glorious state. When God laid them to rest, the Church members were strong in their faith and abounding with love for each other, the Church was stable in all aspects, including its finances. It didn’t have any loans. All these were made possible because they and their helpers faithfully upheld God’s will for the sake of the Church. You were one of those helpers. Our brethren today yearn to see the quality of leadership that they witnessed from the first Church leaders. Unfortunately, this is not what they see. Since Brother Eduardo assumed leadership, we have been witnessing shallow victories. These victories are not reasons to rejoice because these are not for the glory of God, but for the happiness and glory of man. 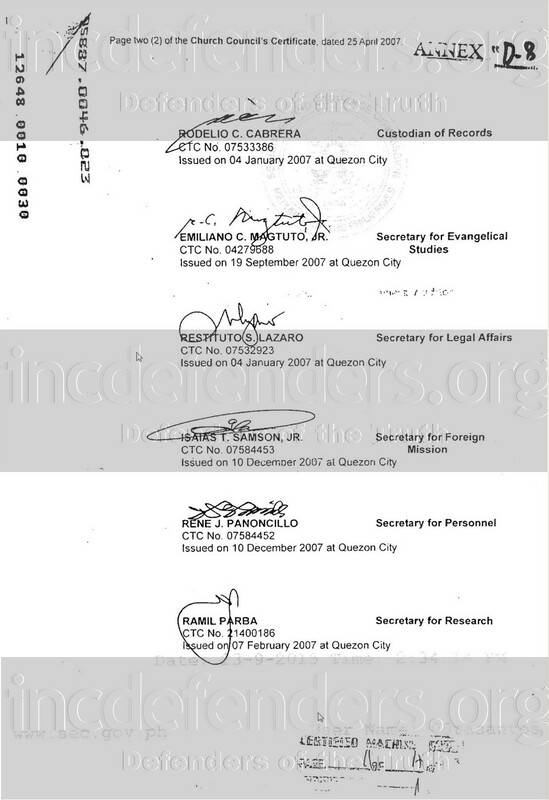 Examples are gained world records on secular matters which have been generously funded from the Church treasury. Church-related world records held on spreading the faith yielded many fruits that are of low quality. Worldwide intensive propagation that involves providing goody bags yielded many fruits, including the newly baptized, who easily turn cold in the faith. Present day propagation focuses on quantity and not quality. This proves that the method of enticing people to join the Church by bribing them with food is not an effective way to spread the gospel. A huge amount of Church funds also goes to waste because of the corruption that takes place in amassing food that will be distributed to non-members. Many of the worship edifices and other structures constructed during the present administration do not compare with those built during the past administrations. Most are barangay chapels which are not built to last long (10 – 15 years). Most of the land used for these chapels are only leased or borrowed (and as such, can only be used for a specific period of time). Other buildings constructed can be considered poor investments because maintenance costs are far greater than their benefits, aside from the billions worth of money wasted on anomalous transactions and corruption by immoral ministers and opportunistic brethren. 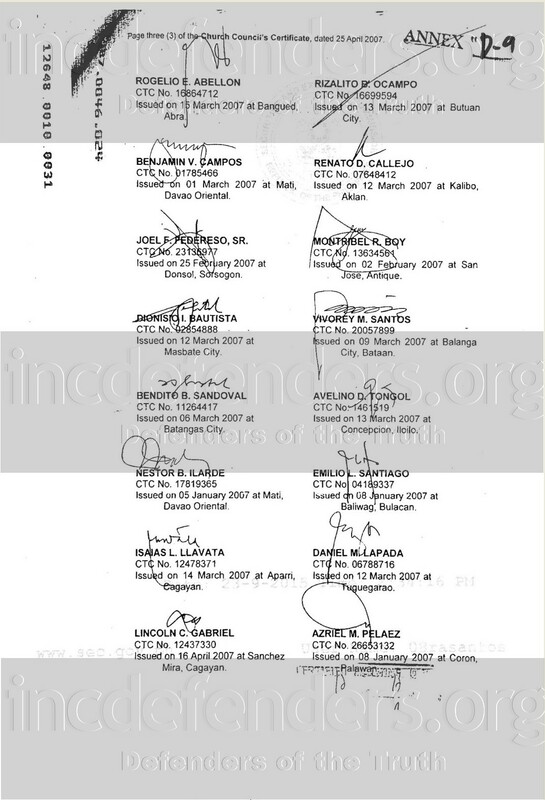 These are only some of Brother Eduardo’s failures in his leadership, but these are enough for the Church to be unstable in many of its aspects, especially in its financial situation. 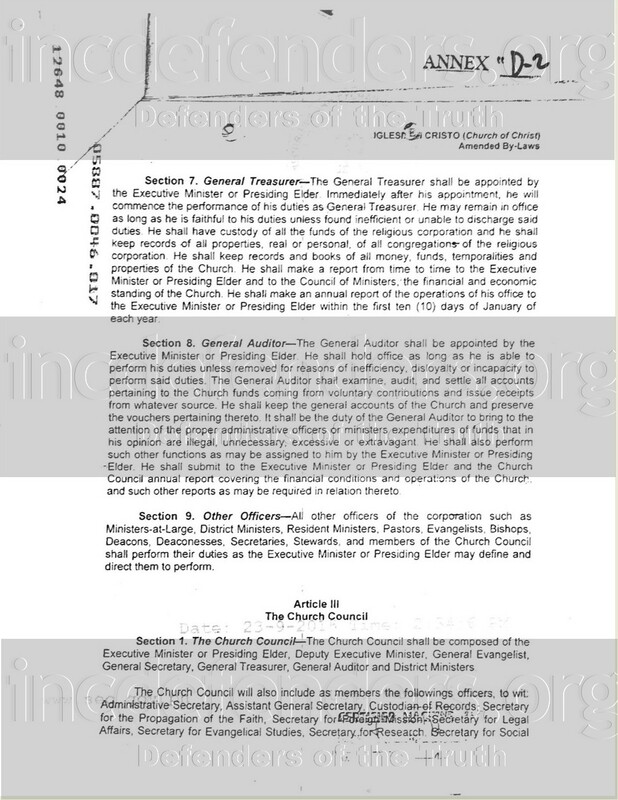 If only brethren, especially ministers who hate those who expose corruption, would realize the truth that the Church has huge debts, they would clearly see that the Church is heading towards bankruptcy and that it would not last for long (there is a separate article on this topic). 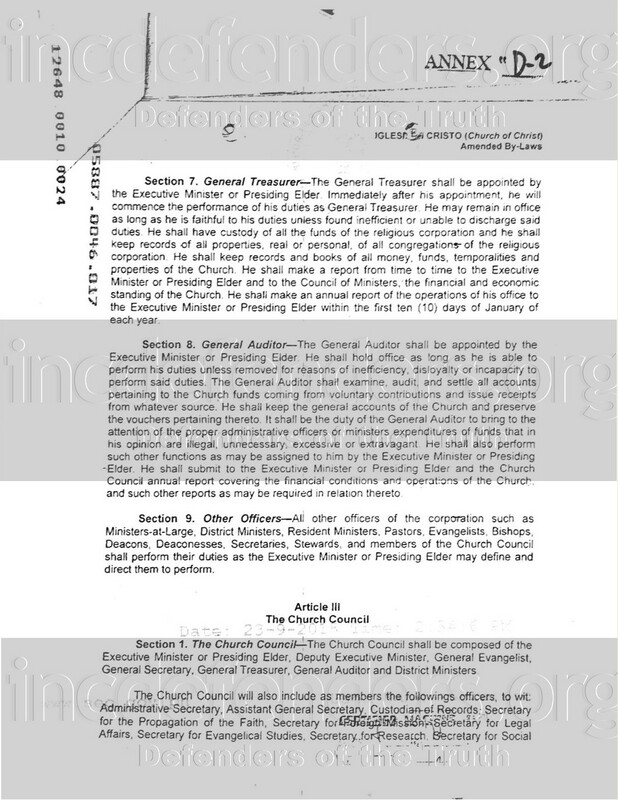 Because of wasteful and anomalous use of Church funds, the Church has incurred enormous loans and many Church properties are mortgaged or given to creditors as collateral. In the whole history of the Church, only in the present administration has the Church experienced utter failure. In view of these truths, will you, members of the Church Council continue to be silent and uncaring of the sad and bad things happening in the Church? Will you continue to prioritize your own selves and your families’ welfare? What about the Church? Will you let all your work for the Church boil down to nothing? Will you let the sacrifices and toil of the previous Church leaders be wasted? If you don’t speak up to save the Church from this miserable condition caused by the evil that prevails today, you will not be able to bring the Church to its perfection and to the salvation that it aspires for when the Lord Jesus Christ returns. Are you prepared for death or Judgment Day given the Church’s current situation? A situation where you are unable to prove to God and to the Lord Jesus Christ that you put the Church’s welfare before your own? ACT NOW BEFORE IT’S TOO LATE FOR YOU AND FOR THE CHURCH! WHO ARE YOU WAITING FOR TO PUT THE CHURCH IN ORDER? IF YOU WAIT FOR GOD, THAT TIME WILL ALREADY BE JUDGMENT FOR THOSE WHO HAVE SINNED AGAINST AND NEGLECTED THE CHURCH. 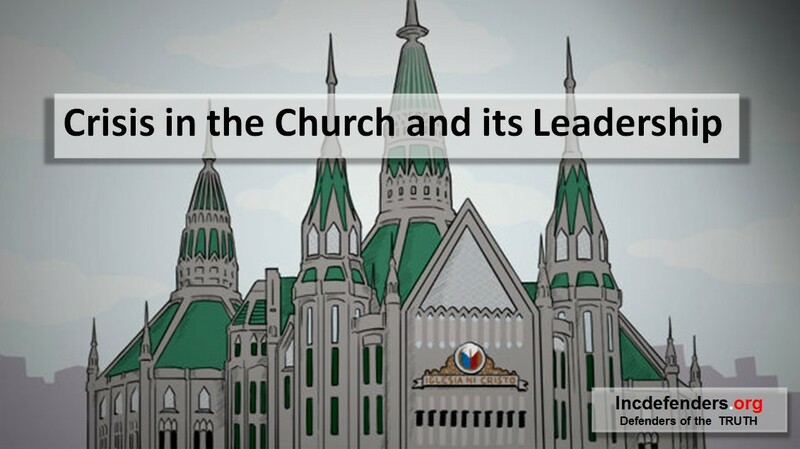 To all those who are aware of what is really happening in the Church, we implore you to beg the Father to touch the heart and to give wisdom to Church helpers who are not yet standing up in favor of the truth and God’s righteousness. May the Lord Jesus Christ shower His mercy and love for the Church, so that it would soon be restored to its holy and glorious state.